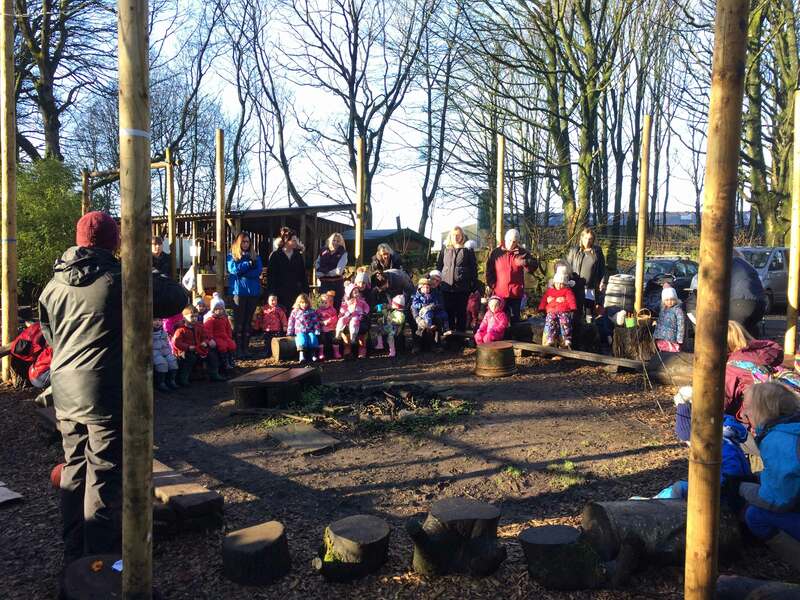 Our toddler group is a great place to introduce children to the magic of forest schools. We currently run 2 weekly sessions at our Brinscall site: Wednesday mornings (Wild Wednesdays) and Friday mornings (Forest Fridays) and one at the Croston site (Muddy Mondays). The groups are aimed at walkers upwards and are very relaxed and informal. We always begin with a brief welcome & safety talk and then introduce the activities. There is a different theme each week – from mini obstacle courses to bug hunting, environmental art to dinosaurs. All the activities are optional and if your child wants to spend the whole session playing in the mud kitchen sink that is absolutely fine. There is always lots to do on site – at Brinscall we have a tunnel, rope swing, digging area, garden toys and the mud kitchen to explore – as well as whatever extra activities we’re doing. At Croston we have a mud kitchen, rope swing, digging area, hammock and use of the play equipment adjacent to the woodland. Half way through the session we stop to have a snack (fruit/crackers/biscuits and squash or hot chocolate for the children and hot drinks and cake for the adults). Most of the activities we do are free-flow and self-led so that your child is free to explore the environment at their own pace but if you’re not sure what to do then please ask and we’ll help you to feel at home. At Brinscall we have a composting toilet on site with a toilet seat and a potty available. Parking is also available on site. There are hand washing facilities and a shelter. We always run the group whatever the weather (unless there are gale force winds!) – if it is raining we have a large parachute tarp to go over the fire circle, an additional tarp and the shelter so there are plenty of areas to keep dry. We also have lots of spare waterproofs to borrow. You are welcome to bring a pram but please be aware that much of the site can be muddy and uneven so it is usually easier to have a sling for younger siblings. In summer we do put down a picnic rug and some baby toys but this isn’t practical during the winter sessions. At Croston we have access to the church toilets and we also provide a hand-washing sink on site. There is no permanent shelter area but we have plenty of tarps to put up when it rains. There is no dedicated car parking but there are several places where you can park roadside and then walk into the church grounds. If you haven’t been before (to either Brinscall or Croston) then please message us for directions as both sites are quite hidden away! The toddler group sessions are £6 per child if you are paying cash on the day (there is no need to book), additional children are £3. For each half term’s worth of sessions (usually 6 weeks) we also offer a block booking option (which works out at £4 per child, £2 for additional children). This option is available for the first 3 sessions. In the winter the sessions run from 10 – 11:30, when the weather is warmer the sessions are 2 hours long. We also now offer a bulk buy option where you can purchase 5 sessions for £25 which can be used at any of the groups over the year. You can either pay cash on the day or message us to arrange a bank transfer.